Lenovo is the official website of Lenovo group limited, the fourth largest personal computer manufacturer on the planet. Alongside with different retail shops and show room franchises, the company serves its customers via Lenovo. The company is run from two epicenters; one is in the east, Beijing, China and the other one is located in Morrisville, North Carolina, USA. A few years back, IBM was an owner of Lenovo (i.e. Lenovo group), but in May 2005, IBM's personal computing division was completely acquired by Lenovo. Founded in 1984, Lenovo group currently has more than nineteen thousand employees. Lenovo is the ideal source to buy a personal computer. 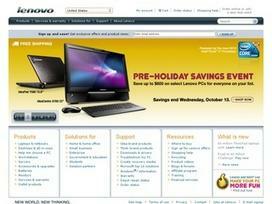 When you log on to Lenovo, you will see some of the many computer products the company offers. The website has a best sellers list and a top rated list so you can make an informed decision on the product you'd like to purchase. The website offers ThinkPad and IdeaPad laptops, ThinkPad and IdeaPad tablets, ThinkCentre and IdeaCentre desktops and all-in-ones, ThinkStation and ThinkPad Mobile workstations, servers, accessories and upgrades, software, and more. All of the products are fully loaded. If you aren't quite sure what product is best for you, use the PCFinder button, which will help you narrow down the computers based on the questions you answer. Then, you will rate the most important of those questions and choose the options you would like your machine to have the most. Once the tool finds the best computer for you, you will be given all of the details on the computer and the customer reviews. The website also offers you other accessories or software that you might like to add onto this computer. It really does make shopping for the perfect computer a whole lot easier. Check out the accessories to make your purchase unique to you. Lenovo has batteries, keyboards and mice, memory, carrying cases, printers, audio equipment, cameras and scanners, docks and port replicators, cables and converters, projectors, external hard drives, monitors and more. You can shop by the hottest deals or search for the products you are looking for. Find items that are compatible with your machine by typing in your model number or select your product from the drop down menu. Looking for information on the latest and greatest machines or upgrades? Sign up with the e-mailing list, and you'll never miss a thing. You'll also receive exclusive discounts for Lenovo. Live chat is available if you have questions or need help with anything on the website. Lenovo is always willing and able to serve you. So what are you waiting for? Join those who DO and get shopping for your perfect machine at Lenovo today. Continental U.S. Only. Excludes 24" LCD and plasma displays. Share what you think about Lenovo, and your favorite ways to save there! Thank you! Saved 15% on a Thinkpad. So small and portable.